The shapes can be decorated with markers, paint, glitter, and more. They're great for adding dimension to boxes, frames, and other craft projects — just glue them on! 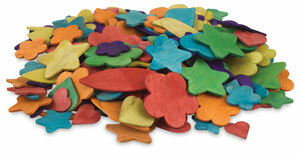 Creativity Street Wood Shapes are sold in Natural in a package of 1000 or Assorted Colors in a package of 104.